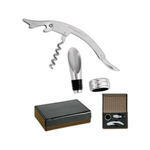 This Cutter & Buck wine gift set includes a stainless steel wine pourer, drip ring and wine opener in a genuine leather carrying case. It’s the perfect gift for families, friends and employees who are wine lovers. Imprint or deboss your company’s name and/or logo on the case and wine opener so the recipients knows who sent this convenient gift.